Carlos D. Camp, herpetologist, is a Professor of Biology at Piedmont College in Demorest, Georgia. He has been on the faculty at Piedmont College since 1983. Don’t let the homespun, son-of-a-south-Georgia-Baptist pastor persona fool you. Carlos is a scholar of international acclaim, and a teacher/mentor par excellence. Steady research efforts and numerous scientific publications over the past 30 years have made him a recognized authority on salamanders of the Family Plethodontidae (the lungless salamanders). He has described two species new to science (and is lead author on the recent description of the remarkable patch-nosed salamander [Urspelerpes brucei]). At a whopping one inch in body length, Urspelerpes is one of the smallest salamanders in the world. It exhibits sexual dimorphism in color and pattern, which is unusual for a plethodontid; and its discovery and naming represents the first new vertebrate genus described for North America in nearly 50 years! Not surprisingly, many of Carlos’ study subjects occupy the cool forests and humid mountain ravines of the southern Appalachian Mountains, a region of especially high salamander diversity. My interview takes place over two days in the spring; the lavender splashes of Bird’s-foot violets color the roadsides. Carlos and I are soldier-naturalists on a specific mission—to find specimens of slimy salamanders (Plethodon spp.) for a study that will examine genetic variation. During our time together he often shuffles a fat stack of USGS topo maps decorated with many dozens of rainbow-colored stick-on dots. The dots correspond, in some mysterious way, to the tissue samples he has collected. How did you become interested in reptiles and amphibians? What is your favorite group of organisms? And why? 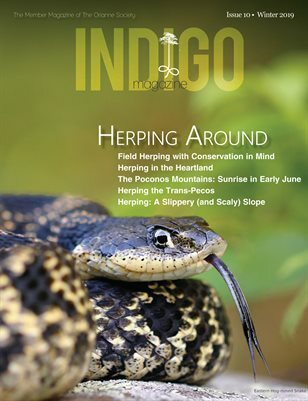 Would you have an entertaining story from your career as a herpetologist? In your career, who has been a huge inspiration? What accomplishment are you especially proud of? Naming that salamander (i.e., Desmognathus folkertsi) after George (Folkerts). And being able to conduct field work in the salamander-rich mountains. On Day 1 we explore rugged ravines and mountain coves where giant hardwoods and hemlocks sport trunks girthy as brontosaurus legs. When I ask Carlos about the imminent death of so many mountain hemlocks due to disease caused by the insidious hemlock woolly adelgid, he looks at me and is silent for a long time. In fact, he never answers. I understand. On Day 2 I eat breakfast with Carlos. “It’s not just ‘cause you’re here, when I am going in the field I make it a point to treat myself.” He wasn’t kidding. My plate is soon heavy with chicken breasts and two plump homemade “cat-head” biscuits (so named because of their size). All washed down with a monster orange juice. Carlos comes with a number of interesting quirks, all of them endearing. He calls me “Flatlander”—a reference to my predominantly Coastal Plain existence (in return I call him “Highlander”). He refers to snakes as “scaly-backs” (rattlesnakes are “jingle-tails”). In the field we speak sporadically, and when we do it’s usually related to an interesting find: “Would you know much about this beetle?” “What species of Rhododendron is this?” And so goes the esoteric dialogue between two enamored with nature. Georgia is ensconced in a record drought. Despite a recent rain, high humidity, and being out at a good time of year, the Plethodon salamanders we are searching for are extraordinarily hard to come by; the soil is far too dry. Finally, nearing 4.5 person-hours of survey effort we jointly roll a large log to reveal the slender form of a salamander. It’s a Plethodon!